Can blisters on the skin mean allergy to a medication? Bullous Pemphigoid with secondary bacterial infection. Caused by an allergy to hydrochlorthiazide diuretic. Yes. In particular there is a condition known as bullous pemphigoid. This eruption consists of blisters scattered over different parts of the body. It is considered to be either a drug (medication) rash or one that is autoimmune (not caused by medication but by the body’s own immune process). The most common class of drugs that cause bullous pemphigoid are the sulfa drugs. These drugs can range from certain diuretics, antibiotics, anti-inflammatory drugs to diabetic medications. The rash is extremely itchy. This eruption can also develop a secondary bacterial infection resulting in crusted lesions scattered all over the body. Bullous pemphigoid must be treated by eliminating the offending medication, as well as topical and systemic therapy. Can a summertime rash that looks like insect bites be something else? There is a condition commonly known as Shingles, which is medically known as Herpes Zoster. This is not related to the STD Herpes Simplex. It represents a reinfection with, or a reactivation of, the chickenpox virus. The rash consists of small fluid-filled bumps on the surface of the skin in clusters. 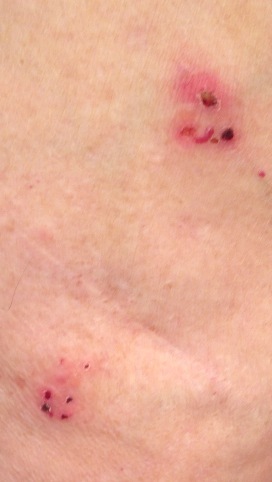 These clusters may be small, as in the photo shown, or can wrap around one side of the body in a Shingles-like fashion. The treatment for this rash is very different from the treatment for insect bite reactions. Individuals who experience itching, burning and/or tingling and pain with a rash as described should see a dermatologist for anti-viral treatment, as well as medication for pain and itching. Are there rashes related to pregnancy? Itching during pregnancy can be something very simple like eczema (patches of dry skin), seborrheic dermatitis (scaling and flaking of the scalp and central face), and other common dermatoses. However, itching associated with blistering can represent a condition known as pemphigoid gestationis, sometimes called herpes gestationis—completely different from what is commonly referred to as the herpes virus. It is uncommon however very symptomatic when it is seen during and immediately after pregnancy. 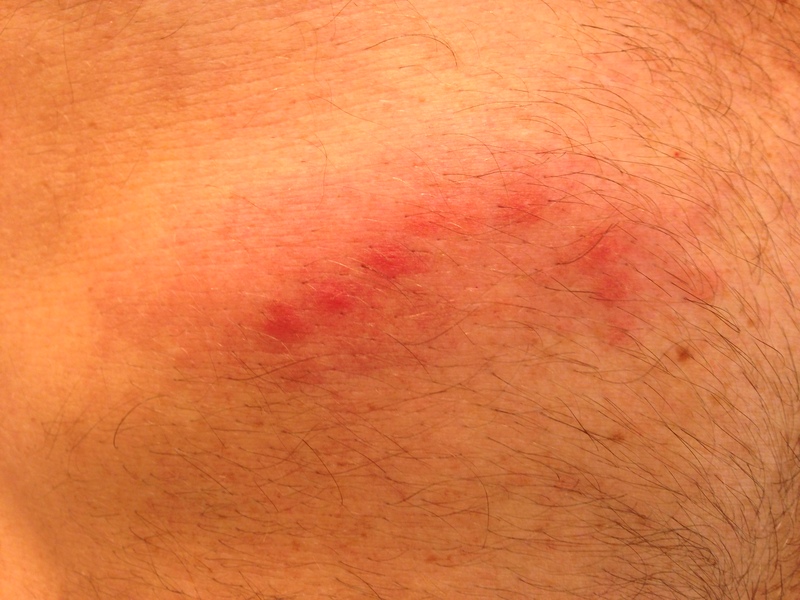 Lesions can appear as red patches or blisters all over the body. Conditions such as allergic contact dermatitis, drug allergies and a condition known as pruritic urticarial papules and plaques of pregnancy (PUPPP) can also be confused with herpes gestationis. The condition may last for weeks or months and is usually treated with various forms of cortisone.